At 5’9” with a strong mind and body matching her stature, Brenda DiBari is a powerhouse in every aspect of her life. There is nothing that will stop her as she manifests this in both her personal and professional life in a highly competitive and often times, aggressive business. It’s not every day that you hear about families living in Manhattan with 6 kids. Yes, SIX! After tragically losing her husband 7 years ago, Brenda was faced with the impossible task of raising them alone, at the time ages 23 months to 17 years. This single mother quickly realized that it was now her sole responsibility to continue to lay the foundation for her children that she and her late husband had started. Though this successful entrepreneur was at the time simultaneously managing her own boutique brokerages in NYC and Miami, she was determined to nourish a driven, tight-knit family. Brenda made the difficult decision to put her career on hold in order to relocate her family to her husband’s native Rome, Italy to give the children a tangible part of their father. While living in Rome for four years, Brenda learned the European real estate market as she met the challenges of guiding her children through Italian schools. Accomplishing these tasks, her children were later accepted into some of the most competitive schools back in the U.S. such as NYC’s prestigious Regis High School and the historic Georgetown University. The insight she gained from a foreign market has served to broaden her intellectual, social and emotional agility. Honing her global mindset and willingness to take educated risks, Brenda returned with a deepened capacity to deliver elevated service to her clients. 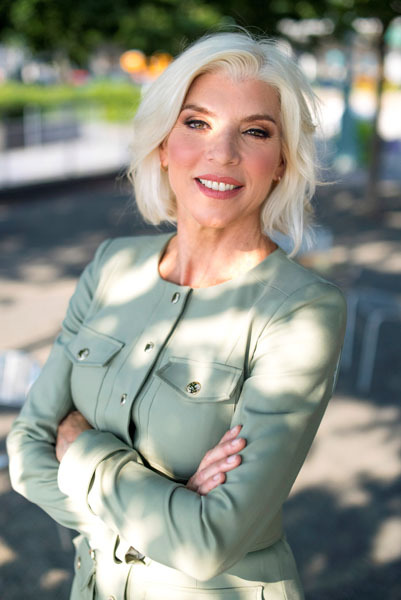 As a 15-year veteran of the real estate brokerage industry, Brenda knows what it takes to be successful and to make the lives of others a success, which includes finding the homes for her clients no matter the ask. Knowing the conditions of the market like the back of her hand, Brenda delivers customized services and intel to her clients throughout the entire process with integrity and tenacity. As a broker with Halstead Real Estate, Brenda uses her analytical skills in navigating the requirements of co-op boards and condo associations, deftly negotiating on behalf of her clients, showing relentless determination to achieve her client’s goals. While she continues to prove her strength in the workforce, Brenda refuses to stop there. Blessed with incredible energy and masterful multitasking skills, Brenda enjoys being busy and thrives most under pressure. She is extremely motivated not only for her clients’ success, but to be an example to her children as their mom and a powerhouse in business.